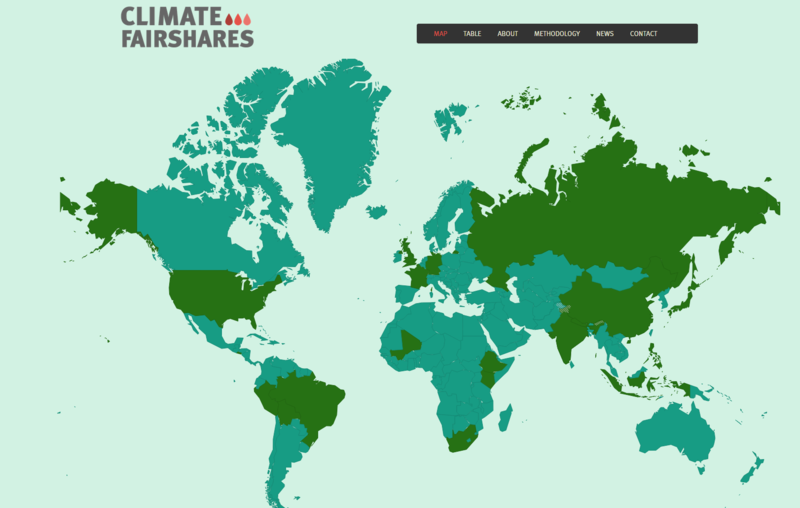 Our new report, National Fair Shares, summarizes the analysis embodied in the Climate Equity Reference Calculator, a generalized approach to considering equitable effort-sharing in an international climate agreement. This approach is designed to preserve “equitable access to sustainable development” even as it drives an extremely ambitious global mitigation program, and is particularly timely as countries prepare to submit their Intended Nationally Determined Contributions (INDCs) to the UNFCCC. In particular, this analysis finds that a nation’s fair share of the global mitigation effort can be quite different from its domestic mitigation potential. Countries with relatively high capacity and responsibility are generally found to have fair shares that greatly exceed their own domestic mitigation potential; therefore, if they are to fulfill their entire fair share, they are required to contribute financial and technological support to other countries. Conversely, countries with relatively low capacity and responsibility are able to act entirely within their own borders. It is assumed that they use international support to undertake mitigation in excess of their own fair shares of the global mitigation effort, and by so doing exploit their full national mitigation potentials. As such, this analysis is informative not only for assessing countries’ INDCs with respect to domestic mitigation action, but international support as well. The quantitative analysis in this report is based upon the Climate Equity Reference Calculator, an online tool and database that allows the user to select “equity settings” relating to key equity-related parameters, including responsibility, capacity, and development need. These settings are then used, together with standard demographic and macroeconomic indicators (e.g., national population, GDP and carbon-intensity) to calculate implied national fair shares of the global mitigation effort. Importantly, this fair share is expressed as a sum of domestically- and internationally-supported mitigation. For a short summary of the report (6 pages) see here. Recently, we were invited to do a post on our “equity reference framework” work for the MAHB — that’s Millennium Alliance for Humanity and the Biosphere, in case you were wondering. Pronounced “MOB.” It’s an interesting project, and it has a significant foothold in the fluid, fertile space where environmental scientists and civil society “actors” meet. The post turned out to be a good introduction to the Climate Equity Reference Calculator, one that situates it firmly in the global climate justice debate, as it’s unfolding in the international climate negotiations. Here a link to it. And here’s the lead . . .
“It’s about 18 months now until the Paris climate showdown. The good news is that there’s quite a lot happening. The clarifying science, for example, is no longer easily denigrated. The IPCC’s 2°C carbon budgets, the new age of “extreme weather,” the fate of the Arctic, these can no longer be cast as fervid speculations. Denialism – at least classic denialism – has peaked. This is a time of consequences, and we all know it. But what about Paris? Why do I even mention the international climate negotiations? Don’t we all know that the North/South divide is unbridgeable? Don’t we all know that the wealthy world will never provide the finance and technology support that’s needed to drive deep and rapid decarbonization in the emerging economies? Don’t we all know that the prospect for a meaningful breakthrough in the climate talks is nil? Though you may not have noticed it, the equity issue is moving in the international climate negotiations. In particular, the Climate Action Network — the largest of the international civil-society network working the climate talks — has floated a discussion paper on “equity reference frameworks.” For more on the context within which this discussion paper emerged, see here. Here’s the beginning of the paper. Or click here for a PDF of the whole thing. “Equity is back on the negotiating table, and this really is no surprise. The negotiations were never going to succeed unless they faced the challenge of “equitable access to sustainable development.” Unless they faced, more precisely, the equity challenge: holding to a 2°C or even 1.5°C-compliant global emission budget while also supporting a common right to adaptation and sustainable development. These are preconditions of any successful climate transition. The difference today is that we all know it. Today, as the negotiations begin again in earnest, the core challenge is to move the equity agenda forward, in a manner that allows us to simultaneously 1) increase short-term ambition and 2) pioneer a track to collective post-2020 emissions reductions that are in line with the precautionary principle. This won’t be easy, but it may be possible. Three conditions will need to be met. First, the Parties must work together, in good faith, to find a way forward on equity. It will not do for each to assert the uniqueness of its own “national circumstances.” There must be a global way forward. Second, pre-2020 ambition must be increased. Developed country targets must be strengthened to be in line with the demands of the science, and significant amounts of financial and technological support must arrive before Paris. Third, there must be a path forward for “common but differentiated responsibilities and respective capabilities,” and it must lead to a dynamic, “equity spectrum” approach to CBDRC that is responsive to global economic evolution. The following remarks were made by Tom Athanasiou, speaking as a member of the Climate Action Network, and in particular as the co-chair of its Equity / Effort-sharing Working Group. The video is here, at 1:12:50. I’d like to begin with two comments on Prof Garnaut’s slides. First, “concerted domestic action” will indeed be needed, and much else besides. As Garnaut noted, the current global emissions trajectory, if we stay on it, would likely to yield “a breakdown in international order.” Second, “concerted domestic action” (Garnaut’s name for bottom up action that is way better than pledge and review) is not going to happen by itself. The ambition imperative calls for a process designed to “guide national targets” with an “independent expert assessment” of national targets and the remaining 2020 to 2050 global emissions budget. Which budget, as we all know, is not large. Let me put this this a bit more emphatically. What is needed is a process that would allow for a proper Equity Review of the pledges, to be conducted in parallel with the equally-critical Science Review. How to think about such an Equity Review? The first point is that the demands of equity have already been agreed. This is true at the level of the Convention’s keystone text on CBDR & RC, and it’s true of the four fundamental equity principles – ambition, responsibility, capacity, and development need – that underlie the principle of CBDR & RC and, of course, our shared vision of “equitable access to sustainable development” as well. A renegotiation or rewriting of that principle, or any other Convention principle, is not needed. Rather the opposite. Such an approach as this would give life and meaning to the principles of the convention. There will be skepticism about a process as ambitious as the one I propose. But do note that equity frameworks – based upon indicators that transparently represent the principles of ambition, responsibility, capacity and development need – are actually pretty easy to model. And note as well that a generic, non-equity based spectrum approach, one that is for example confined to the “type and scale” of commitments, will not suffice. We need an equity spectrum. A spectrum without equity will not work. In fact, it would be an invitation to free riding. It would not give us a way forward. The Mitigation Action Plans and Scenarios project in South Africa recently organized an interesting workshop on “Equitable Access to Sustainable Development.” The public report of the workshop is here, and it’s worth spending some time with, particularly because of the depth and sophistication with which it engaged with the problem of ‘Equity Reference Frameworks.” Which here, we believe for the first time, have an acronym! (ERF, of course). See in particular the report from the workshop, Reflections on Operationalizing EASD, and the background paper on Equity Reference Frameworks and their operationalization, by Xolisa Ngwadla of the South African Council for Scientific and Industrial Research. “The underlying philosophy for an ERF is the universal application of egalitarian principle to guide a distributive view that seeks to address historical, current, and potential inequities in respect of contribution to emissions, and as such is corrective in character, and distributive in approach. In respect of the metric/non-metric chasm, a stepwise consideration is proposed, where there is an ex ante assessment of fair effort in a non-binding framework, with binding commitments proposed by parties and therefore catering to national circumstances. The next round of the climate negotiations are now proceeding in earnest, and they’re taking place within civil society networks as well. One of those networks, the most established and extensive of all those working within the climate talks, is the international Climate Action Network, which consists of over 700 NGOs from around the world. And CAN, as it is called, has now agreed on its own positions, which will be the basis of its future lobbying and outreach . These positions are represented by two “submissions” to the UNFCCC secretariat. The submission to “Workstream 1” (which covers the post-2020 regime that is now being negotiated) is here. The submission to “Workstream 2” (which covers the effort to increase ambition prior to 2020) is here. More precisely, CAN believes that the Parties should seek a new approach to global differentiation that is transparently based upon explicit and clearly-stated equity principles, and upon indicators that embody those principles. Not that such an approach can alone define national obligations. But it can productively inform the negotiations, and it can help to shape a common understanding – a shared vision – of the equity challenge. Parties should consider various approaches. One possibility is a hierarchical approach in which the existing annexes are reworked and then subdivided into finer annexes. Another is a spectrum approach in which all countries are assigned values on an agreed equity index. What is critical is that the equity principles that underlie any proposed approach be specified, embodied in well-designed indicators, and used to estimate a set of national obligations – for both mitigation and international financial and technical support. In the spectrum approach, the “equity index” would be composed of a basket of more specific equity indictors. This basket would have to contain well-designed indicators that, taken together, measure both responsibility and capacity. It could include, inter alia, measures of per capita income, measures of per capita emissions, measures of standards of living, measures of historical responsibility, and measures of intranational income inequality. Such an approach would not preclude country groupings (like today’s annexes). In fact, it would make such groupings more coherent. For example, the set of countries that is high in capacity and responsibility would change over time – an important fact, given that such countries are candidates for ambitious, legally-binding economy-wide quantified emissions reduction targets. Of course many other kinds of commitments are also possible, and desirable. Obvious examples include renewable energy and/or energy efficiency targets and sectoral targets, all of which could have various kinds and degrees of bindingness. Also, it should be noted that some kinds of actions – for example, nationally-appropriate mitigation actions – can be explicitly contingent on financial and technical support. The What Next Forum in Sweden has just published a nice, up-to-date overview of Greenhouse Development Rights. Many thanks to Niclas Hällström for pushing us to put it together. Weighing in at about ten thousand words, The North-South divide, equity and development – The need for trust-building for emergency mobilization is now the best single introduction and overview of GDRs around, and we’re very glad to have it. We’re particularly glad because this essay contains an extended discussion of how GDRs – as an “equity reference framework” – could help us navigate a trust- and momentum-building transition to the high-ambition mobilization that we so desperately need. 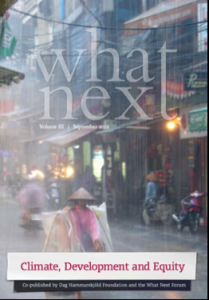 By the way, this new GDRs overview is part of a book-length collection of rare relevance called What Next Volume III: Climate, Development and Equity. Take a good look at the Table of Contents page. There’s lots of excellent stuff here. The first of our “next generation” of country reports was just done, for Norway, together with Norwegian Church Aid and the ACT Alliance. The report — Norway’s fair share of an ambitious climate effort — is the firs major report that we have done since we updated and generalized the Greenhouse Development Rights system, and re-released our calculator as the Climate Equity Reference Calculator. This report is also notable for restricting itself to the “Strong 2C mitigation pathway.” In other words, the very challenging numbers in this report are associated with an extremely ambitious global mitigation transition, one that would actually have a good chance of stabilizing the climate system.